The above info came from Shinryu, and was edited by yours truly (contact me). The image came from anime-direct.com. Air shows a paranormal story of a young man, called Yukito Kunisaki. He chases an old tale, told by his passed-away mother, about a winged girl in the sky. One day, he gets stranded on an island, where he meets the somewhat strange and clumsy girl Misuzu Kamio, and with the permission of her mom, Haruko, Yukito can stay at her home for the time being. 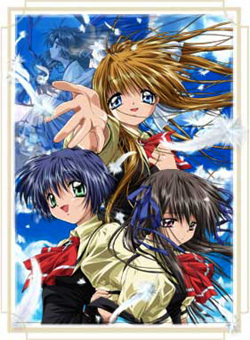 A bit later on (all in the first episode), he meets the girls Kano, Minagi, and Michiru, all with different personalities. While being together with the four girls, he chases the told tale, and solves the individual stories of the four girls doing so. All of their stories seem to have a connection to the winged girl, and he decides to stay on the island. While the first episodes of 'Air' can be rather funny, the later episodes show dramatic and paranormal stories, which can be very confusing, even after watching the whole series. The above description came from TheaN, and was edited by yours truly (contact me). Yukito Kunisaki is a wanderer. He travels from town to town, searching... searching for a winged girl in the sky, a story passed down in legend through his family. One summer day, he comes to a small town by the ocean shore. Here, he meets Misuzu Kamio, a strange young girl intent on being his friend. This is the story of the thousandth summer. This is the tale of many, the tale of those thousand years, culminating in the face of their relationship. The above description came from Shinryu, and was edited by yours truly (contact me).